Marvel may be making twelve comics available for retailer exclusive variant covers in December. But as we have been noting, with so many being offered, only a few will be taken up. Marvel have cannibalised their own market for this sort of thing. DC Comics, however, offers one every two or three months. As a result, they will get many, many takers. It order to qualify for a cover exclusive to your store, you have to order 3000 copies and pay a fee to the approved artist. Variants of that cover can then also be ordered in 1500 and 1000 increments. While this is an expensive solution for both parties it can help the publisher’s overall numbers and provide promotional opportunities for the retailer. 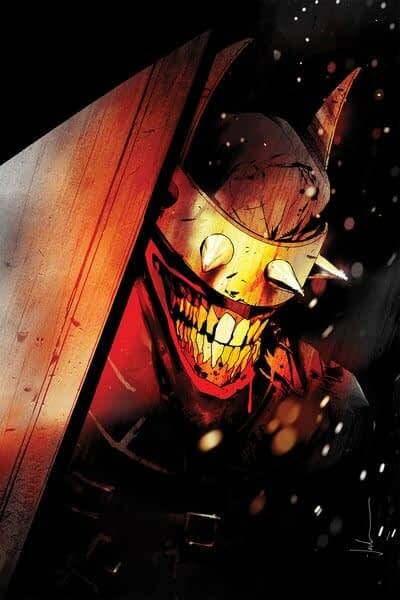 Especially when the next one for December is The Batman Who Laughs #1 by Scott Snyder and Jock. In this debut issue, Bruce Wayne must come face to face with the nightmares spawned from the Dark Multiverse. But even though evil devoured evil in the collapse of Challengers Mountain, the Dark Knight still has his doubts. He discovers that the Batman Who Laughs not only survived the fight with The Joker at the end of METAL, but now he is enacting a sinister plan across the Multiverse-something both terrifying and oddly familiar. But when Bruce Wayne realizes the only way to stop this madman is to kill him, he must consider violating the very rule Batman won’t break…the same rule that created this insatiable villain-the Batman Who Laughs! Those interested should contact Vince Letterio, DC’s Executive Director – Comic Book Specialty Sales for further details. Tell him Bleeding Cool sent you. He’ll just love that. Here’s the regular covers that everyone else will be getting… will your store?